On Modern Famil Season 7 Episode 1 Haley tries to stop Andy from proposing to Beth. 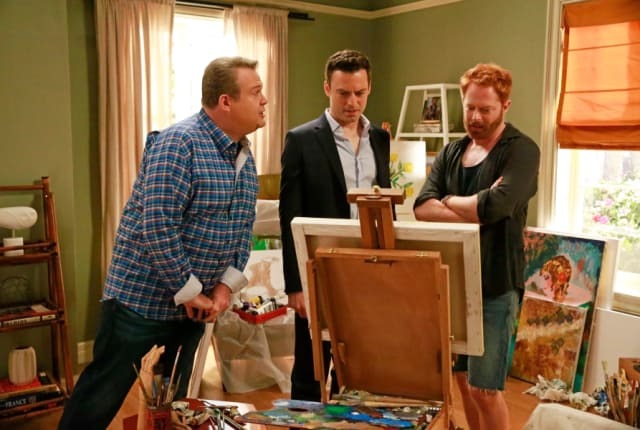 Find out if they finally get together when you watch Modern Family online. You can see the emotional wreckage of Haley's attempt to stop Andy from proposing when you watch Modern Family Season 7 Episode 1 online. The episode picks up right where the season 6 finale left off, and Phil frantically tells the family that Andy's about to propose to Beth even though he and Haley have feelings for each other. Claire takes Haley to the beach where Andy is about to propose but she is asks Haley whether or not breaking them up will be worth it. As a result of Claire's question Haley misses the opportunity to stop the proposal. They skip ahead to June and Cam and Mitchell discuss Mitchell's decision to take time off from work. Back at the Dunphy house, Claire enjoys feeling needed and helps Haley wallow in self-pity. Together, Claire and Haley make a quilt from Haley's old clothes. Haley struggles with seeing Alex and Sanjay in a happy relationship. Phil is distressed by Claire's behavior and encourages Haley to take a shower before they all go to the movies. Jay and Gloria are touring preschools for Joe only to discover that they are too late to get Joe into high-end preschool. On their way to the movies, the Dunphys (minus Alex) run into Dylan, Haley's old burn-out boyfriend. Haley and Dylan reunite and Claire questions her choice to stop Haley from breaking up Andy and Beth. In July, Cam is fed up with Mitchell's unemployment and stalks Mitchell's old boss Charlie in an attempt to get Mitchell his job back. Jay and Gloria check out the only available preschool, which is in a barn. While touring the school Joe catches and kills a chicken. Andy overhears Claire and Phil talking about Haley's attempt to stop his proposal. Skipping ahead to September, everyone gathers at the Dunphy's house. Andy returns and it is evident he has been stress-eating. Claire and Phil feel responsible for Andy's dramatic weight gain and Haley overhears them. Haley and Andy finally talk about their feelings but they both end up leaving in anger. On Modern Family Season 7 Episode 1 Haley tries to stop Andy's proposal. Claire and Phil interfere. Mitchell has a mid-life crisis.